Chris Bavin is so full of character he was born to be on TV. After a TV production company first stumbled across Chris Bavin in 2011 he has gone from strength to strength and is currently co-presenting his fourth series of BBC1’s hugely successful series Eat Well For Less? With Gregg Wallace. The show has had incredible ratings across its first three series with the next two to be aired in 2017. In addition to Eat Well for Less, Chris has presented Tomorrow’s Food with Dara O’Brian, The Truth about Meat and he is co-presenter of BBC1’s returning series Food:Truth or Scare with Gloria Hunniford. Chris is the co-founder of ‘The Naked Grocer’ a retail business that was twice voted as ‘National Independent Retailer of the Year’ award as well as ‘Best Contribution to the Community’ award. The Naked Grocer is now an online business supplying catering, fruit boxes for offices as well as vegetable boxes for the public. Chris Bavin’s first job was as a junior flower trader, a job he relished and excelled at. He spent much of his working day in various wholesale markets across the UK, places where Chris felt very much at home. Packed full of all the colourful characters and the buzz that a busy wholesale market provides, Chris felt he had found his vocation. After selling flowers into the wholesale markets and retail multiples for six years he took a side step to trade fruit and vegetables. This again was something that he not only enjoyed but did very successfully. He has worked in all areas of fresh produce: importing, wholesaling, retailing, food service & catering. Chris is passionate about educating and raising awareness in children of where food comes from and encouraging them to learn how to increase their consumption of fruit and veg. One of his ambitions is to teach others how eating healthily can be cheap and easy to achieve. Chris is currently working on writing his first book. Chris has great interest and knowledge in farming and all areas of fresh produce, in particular the history and future of food, reducing food waste, wholesale markets and of course flowers and plants. 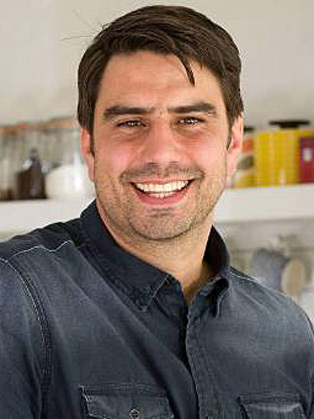 In 2018 it was announced that Chris Bavin will be a judge on BBC's new cooking competition Britain's Best Cook alongside Mary Berry and Dan Doherty.